This is the sixth article in a series on hikes in DC that can be reached by public transportation. Although part of Roosevelt Island has been commandeered for a formal plaza with a statue of Teddy Roosevelt -- not literally carrying a big stick, but at 17 feet tall, imposing nonetheless -- the rest is a surprisingly diverse oasis in the midst of an intensely urban setting. Yes, you can hear multiple highways. Yes, you will hear planes flying low overhead as they take off and land at National Airport. But somehow, it is possible to ignore all that and enjoy the riches the island has to offer. It's hard to get too lost once you're on the island, but here is a map of the trails to help you plan your visit. 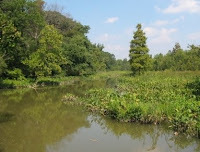 The island includes areas that are bottomland woods, typical of what you'd see in other parks along the Potomac. More unusual is a tidal freshwater marsh on the interior of the island, along the Swamp Trail. The wetlands include numerous flowers that attract pollinators over the summer, including pickerel weed, hibiscus, cardinal flower, joe pye weed, and ironweed. 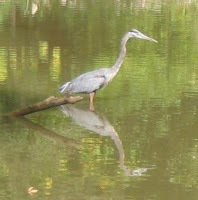 Some of our notable wildlife sightings here include hummingbirds, great blue herons, and a cuckoo. Take Wilson Blvd. to North Lynn St.
Go north (left) on N. Lynn, crossing Lee Highway (which includes two multi-lane sections and a bridge over Rte. 66). Just after you've passed the west-bound section of Lee Highway, take the paved hiker-biker trail going to the right. Follow the trail over a pedestrian bridge over the GW Parkway. Once you're over the Parkway, you'll head south (downstream) along the path, through the parking lot, then take another footbridge across the river to the island. By this route, it's about .8 mi from Metro to the island. From Georgetown, you can cross the Key Bridge, stay on the left and follow the same path off N. Lynn at Lee Highway. Dogs: "Pets are permitted on Theodore Roosevelt Island if they are wearing a leash no longer than 6 feet and the owner is holding the leash at all times." Bikes: Bikes are a great way to get to Roosevelt Island, but they're not allowed on the island. Bicycles are allowed on Metro trains all day on weekends, and at non-peak times on weekdays (not 7 a.m. to 10 a.m. or 4 p.m. to 7 p.m.). There's a bike rack by the footbridge.